Why use Cloud Services? What is in for me? The terms “cloud”, “cloud services” and “cloud computing” seem to be everywhere these days. Everyone talks about it, everyone uses it, everyone is fascinated by it, but who really knows what the cloud is and – more importantly – why one should use it? Generally, the term cloud derives from the cloud drawing that used to symbolize the Internet itself. 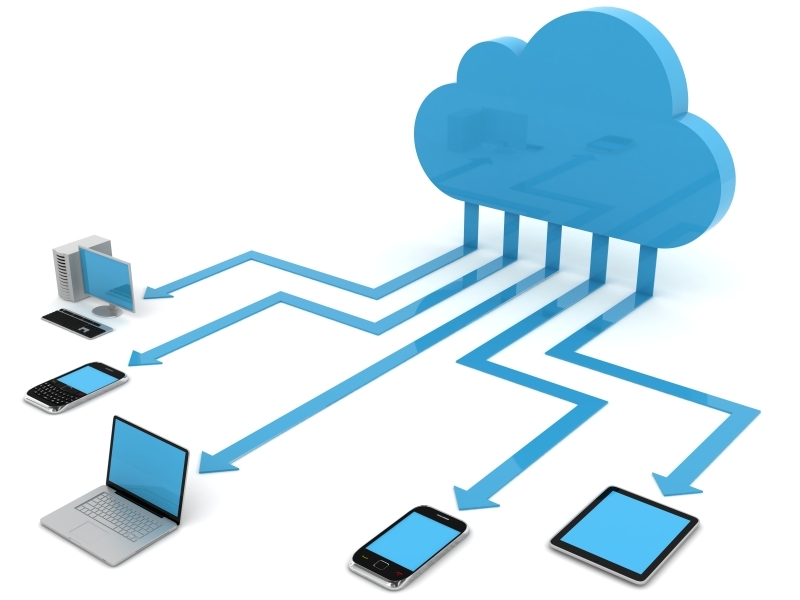 The connection between the cloud (as we use the term nowadays) and the Internet is obvious: cloud computing refers to managing your data via a third party network, hosted over the Internet. In a nutshell, cloud services basically offer you a hard disk on the Internet. Using a cloud service, you can access your data from all your devices. In practice this means that you can have your private and work-related documents, family pictures, videos, music etc. with you at all times, wherever you are. So, if you meet a friend in a coffee shop, you can show him your holiday pics on your tablet. Or, if you’re on a business trip and forgot an important document, you can access it via an external computer. Awesome, right? As all associated services are fully managed by the provider, you don’t have to care about anything. You don’t need any additional physical device (like an external hard drive), only some kind of end device (which should not be a problem in times where the number of mobile devices nearly exceeds the world’s population) and access to the internet . Also many businesses have discovered this advantage. It’s for sure one main reason why the percentage of enterprises using cloud computing is about to rise from 36 % to 52 % this year. Your storage space in the cloud is elastic. Meaning that you can alter the size of the storage space you need at any given time. Unlike using a hard disk, which is full at a certain point, you can expand your “online storage space” anytime. Text messaging cloud services: ??? Quite some time ago text messaging was a sole network operator business. None of these operators has ever cared about a text messaging cloud. They disregarded the benefits a service like this would offer their users. Fortunately these days are over! mysms recognized the opportunity and grabbed it. 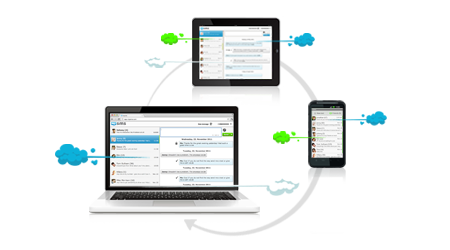 The mysms Cloud is a text messaging cloud which offers its users features that facilitate managing one’s messages enormously. All text messages are synchronized between all devices. This means that a user can access his/her text messages, images and files wherever s/he is, using any kind of end device. Additionally to the convenience of not having to care about saving or losing one’s messages, pictures and files, mysms comes in handy for users who are not bffs with their smarphone’s keyboard. The mysms cloud enables users to type messages on their computers. Talking about crazy – the mysms Cloud is free of charge. All sent and received text messages, pictures and files are saved in the mysms Cloud. No text message will ever be lost again. Furthermore, if you’re changing devices (get a new smartphone for example), your old messages go along with you – automatically. All in all, I’d say that cloud computing is one of the greatest advantages today’s technology has to offer. For the end user it seems to be an easy-to-manage tool, which is great because that’s exactly what it’s supposed to be. Some still haven’t recognized they are already using a cloud service (e.g. Facebook, Gmail), but will do soon when you help us spread the word. So, please share and let your friends know why they should use cloud services and what’s in for them! Great service!!! Thanks so much. I have 2 issues which I’d appreciate some feedback on. I have a Samsung 10.1 tab. The voice recogniTion works on every applicaTion excepT when I’m sending an insTanT message from my s m s. Also, the notification sound I’ve chosen works when I get an email but not when I getting instant message from my sms does anyone have an answer for this? thanks a lot for your praising words! Concerning your 2 issues: Which voice recognition are you using? A native one or one you downloaded in a store? If you use a downloaded one, please send us the Google Play Link. Concerning the notification sound, please check if your sound notifications in your mysms settings are activated. Let me know, if have any further questions. Cloud technology has change the whole technological economic trends, and make technology reasonable and affordable.